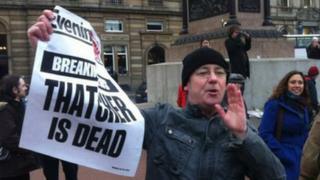 Glasgow City Council urged people to stay away from the city's George Square after hundreds gathered to mark the death of Baroness Thatcher. The event was organised by posts on social media. It's believed the gathering took inspiration from the song George Square Thatcher Death Party by the Glasgow group Mogwai. The council said it had become aware of plans for an event circulating on social media, and about 250 people gathered in the square outside the city chambers by early Monday evening. The statement said: "Regardless of whether or not it's appropriate to have a party to celebrate someone dying, this event was organised without involvement or consent from the council and we have safety concerns for anyone attending. "We urge people to stay away." By around 22:00, the crowd was reported to have dispersed without incident.